ACC Archiline Ltd. produce and delivers wooden house kits, wooden saunas, summerhouses and pergolas to the countries of EU, Asia, Africa, America and Australia. Keen interest in wooden houses from Belarus is clear: quality of Archiline wooden houses is high, while the price is pretty low in comparison with European analogues. Export of wooden houses is a difficult and responsible process that requires knowledge of many nuances. Also, not every wooden house can be exported to the European Union without quality revalidation. That is why ACC Archiline received the Certificate of constancy of performance of the production and European Technical Assessment ETA 14/. These documents confirm the quality of our product and allow us to use CE marking on it. - We offer only high quality products, respect our customers value our name. - You will have an opportunity to see the quality of our materials and works, get professional advice of our specialists, and choose the best option of the house design and its characteristics: plan, elevation marks, wall thickness, type of material (glued timber, rounded logs, and so on.). - Our designers will work out in details the design of the house; take into account your wishes together with the requirements of reliability and durability of the building. - We have an experience of export supplies; we know the specifics of the preparation of documents and customs clearance. We have extensive business contacts with road carriers, thus, we can make delivery of your house carefully in a timely manner, and at a reasonable price. - You don’t need to risk before the manufacturing of the house kit and make an advance payment of 90-100% of the order cost. All payments are made in stages. We can help you to assemble the house in your country on the finished foundation. We will provide you with our specialists in an amount of 1-2 people, who will supervise the process on the construction site. With the help of local workers in the amount of 2-4 people, we will build your house in 3-4 weeks. How to order a wooden house? Want to live in a warm, safe, environmentally friendly and beautiful house? Round logs and profiled timber can be of natural humidity of technically dried. You can ask our specialists about the differences, pros and cons of each type of material. All wooden elements are treated with high quality wood preservative. Additionally, the price for the kit of the house may include wooden windows, installation supervision, wooden stairs and other elements. Shipping cost is calculated individually. - Invoice and so on. Our customers from abroad often ask us about the possibility of ordering a house with all the additional elements like foundation, roofing, flooring, electrical wiring, water pipes, etc. 1. 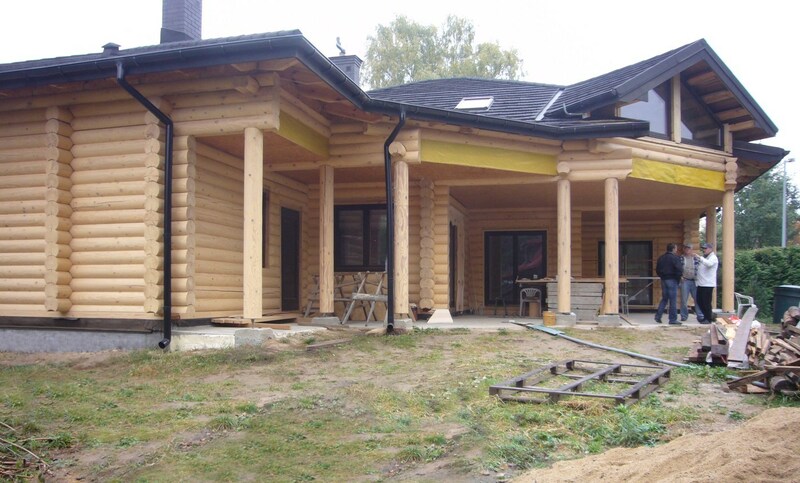 In Belarus, the overwhelming number of construction and decoration materials (except wood) is imported from abroad. Therefore, there is no reason to sell you the materials, which came under the double tariffs (when importing to the territory of Belarus and exporting from it). Another reason is transport. For example, there is no use exporting concrete for foundations or roof covering from Belarus because the price you’ll pay for the shipping will be even higher than the price of the materials. 2. In every country customers has their own traditions, wishes, which are just impossible to take into account during the production of a house kit. If you order only wooden part of the house, it will give you a chance to choose other materials in the region where you live, you will be able to take into account all the nuances and purchase materials that meet your expectations on price, quality, color and design. Once you have gone through all these 4 steps - Voila! You are a happy owner of eco-friendly wooden house, which will have positive affect on your health and the health of your family members. You’re the owner of the house, where you will spend many happy days, a house that will breathe with you. Why we can’t tell the "approximate" price of the house? Based on your wishes, we will prepare the relevant calculations and make an offer. Usually, house kits are delivered by trucks directly to the customer construction site. For these purposes, we use truck with load capacity up to 20 tons. A small wooden house or sauna can be placed in one truck. If the amount of materials for your house is more than one truck can contain, the shipment is being divided in parts: first truck – the bottom part of the house (so you can immediately begin to assemble it), then the upper part. Our experts will make the necessary calculations and determine the number of trucks for you! The possible variant of shipment to America, Asia, Africa, Australia, and Oceania is by sea in 20 and 40-foot containers. There are a lot of important details in exporting of wooden houses abroad, the ignorance of which can lead to big problems. It is important to know the climatic conditions of the Customer's country and special wood preservatives. Lack of experience may lead to a massive blue discoloration of wood and log cracking. Also, there can be mistakes in the customs documents and certificates, and this will cause delays of delivery, unloading on the border, and many other problems. That’s why it’s very important to work with professionals in this field. ACC Archiline Ltd. has 12 years of experience in wooden construction and exportation of wooden houses. Commit your life and your future to professionals!